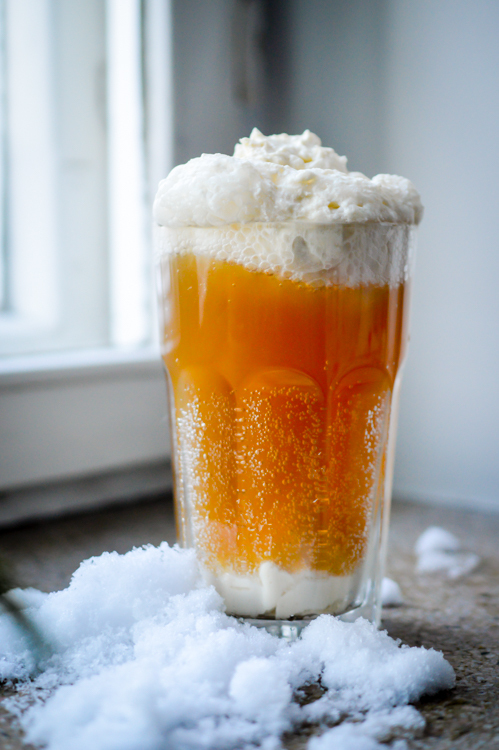 I was looking for a more unusual winter drink when I found this recipe for a Harry Potter inspired butterbeer. I wanted to make it for Christmas Eve and the recipe seemed to suit well since, unlike the name suggests, there isn’t actually any beer in it. 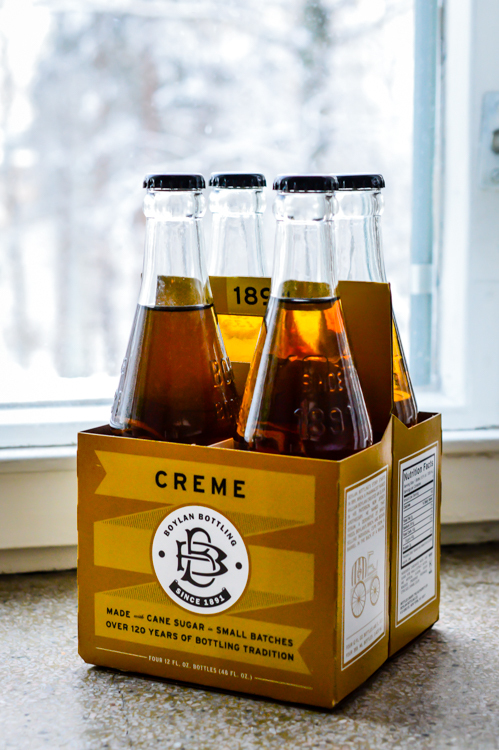 The recipe uses cream soda which I had never had before, so I first bought a bottle to try in case I didn’t like it. 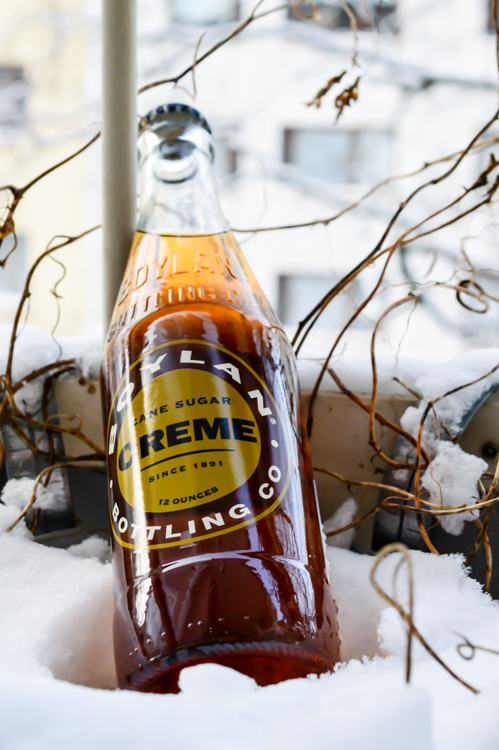 In the Finnish stores there aren’t many options for cream soda, so basically the only one I could find was Boylan‘s Creme Cane Sugar. It tasted really great and decided not to look for other brands. I changed the amounts around a bit because first I had made a bigger batch and in the end we had too much cream left over. Not a bad thing though. The maple buttercream is so delicious I think it would work well in a cake as well. Otherwise you can of course always drink another butterbeer but it is quite heavy and I didn’t manage to drink a second one on the same night, although I really much wanted to! This recipe is with the adjusted amounts, so you shouldn’t have any extra cream but of course it depends depends a bit on the type of glasses you’re using. Same for the cream soda. I used a bit less than a bottle per glass. Chill you glasses in the freezer or outside if it’s cold enough and start making the maple butter. Melt the butter and 4 tbsp of the maple syrup on medium heat on the stove and bring it to a simmer while constantly stirring. It will get thicker and smell like fudge. Set aside and whip the cream with a bit of salt and 2 tbsp of maple syrup until it is light and fluffy but not completely firm. You will still have to add the butter mixture, so don’t overbeat it! Add the maple butter slowly to the whipped cream and mix until everything is smooth and foamy. 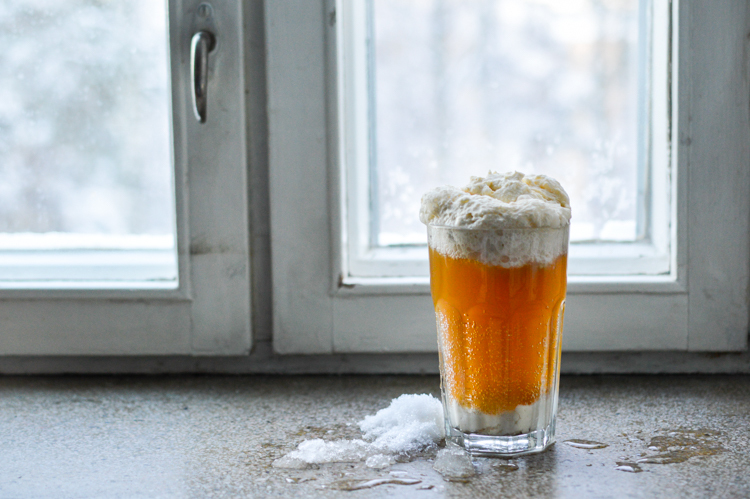 Now you can take the glasses out of the freezer and add a little bit of the cream (~heaped tbsp) to the bottom of the glass and also some whiskey if you want. Fill it up slowly with cream soda. It will produce a lot of soda foam, so you should take it off. Top your drink with another spoon or two of buttercream and enjoy! If you have cream left over you can use it for desserts or another drink the next day. My cream went a bit runny the second day in the fridge but I could whip it up easily. Enjoy! I actually don’t remember if I ever had a proper eggnog. Many years ago a good friend of mine made an eggless eggnog when we stayed Christmas in the Dakhla Oasis in Egypt, where we had been for excavations. She didn’t want to use raw eggs because we already had managed to get salmonella from raw cookie dough a month prior to Christmas, so they were out of the question. While salmonella is not so much of a problem in Finland, I still wanted to stick with an eggless eggnog recipe. After realizing that I don’t really drink cow milk anymore either, I decided to make it completely vegan. 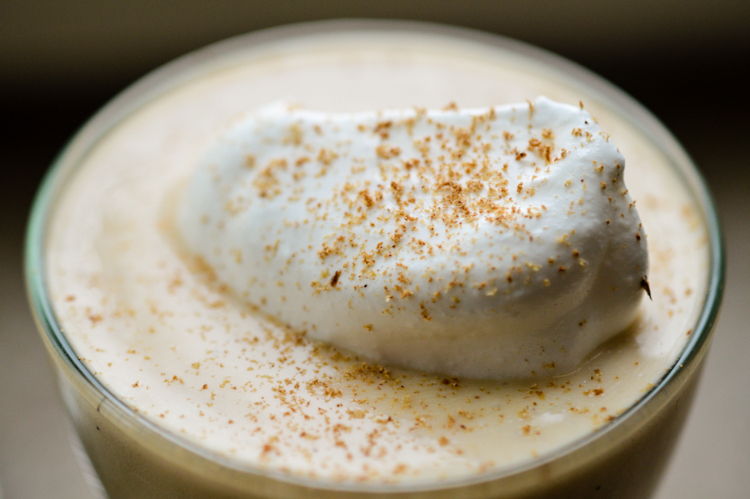 If you don’t want to have a vegan eggnog but keep it eggless nonetheless, you could also switch the almond milk for a full fat cow milk and use normal whipping cream. Take a tbsp of the almond milk and mix it with the corn starch. Set aside and heat the rest of the milk on medium heat with the vanilla. I added empty vanilla pods to give the milk a nice flavour. You can now add the sugar. How much you’ll need depends if you use a sweetened milk or not, so add a bit more than 1/3 cup if it’s not sweet enough for you. When the milk starts to simmer add the cornstarch/milk mixture to thicken it up. Take it off the heat and start whipping the soy cream. Keep a few spoons for decorating the eggnog later and gently stir the rest of the cream under the almond milk mixture. Let it cool down in the fridge (or outside if it’s cold enough). 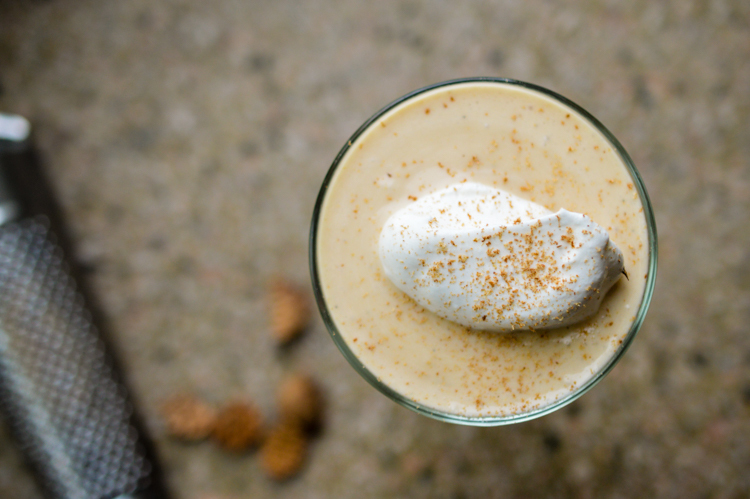 Add rum or brandy to your eggnog or leave it like it is. 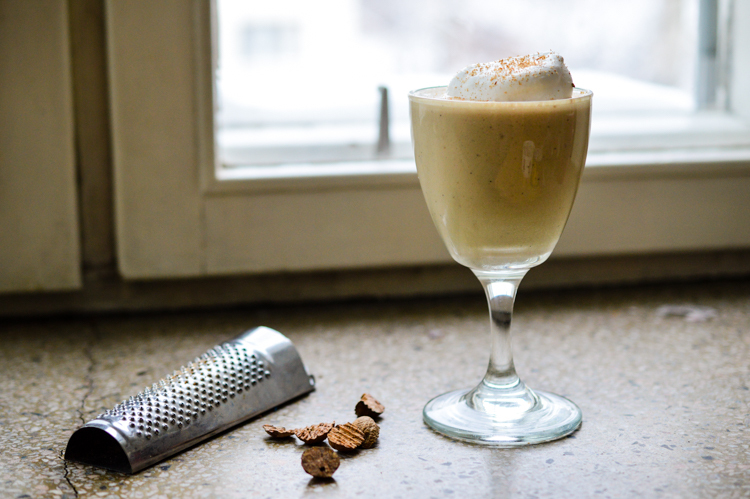 Pour in glasses, scoop a bit of cream on top and decorate with some freshly ground nutmeg! Enjoy! If you still need a Christmas gift and don’t have much time on your hands this will be perfect. Done in less than half an hour and so good you might want to consider keeping it. I recommend making a bigger amount, so you don’t have to be sad to give it all away but instead can keep some for yourself. There is no black tea in the recipe, so for some chai just brew some tea, warm some milk and add as much syrup as you like. You can also flavour your coffee with it. 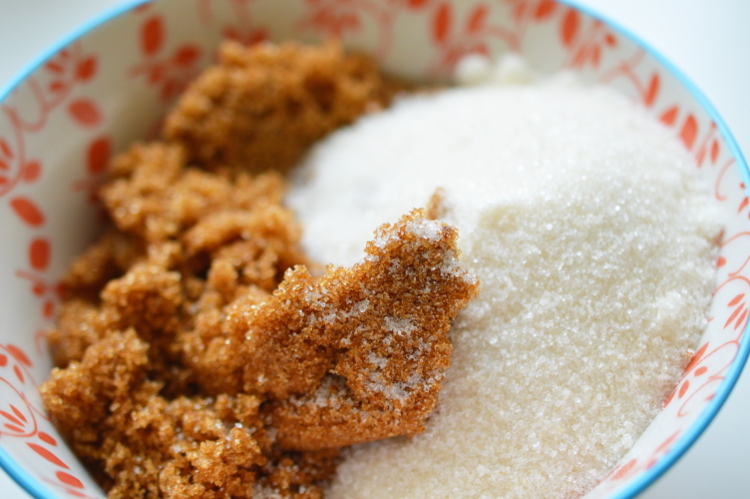 For the recipe I used a mix between farin sugar and cane sugar. 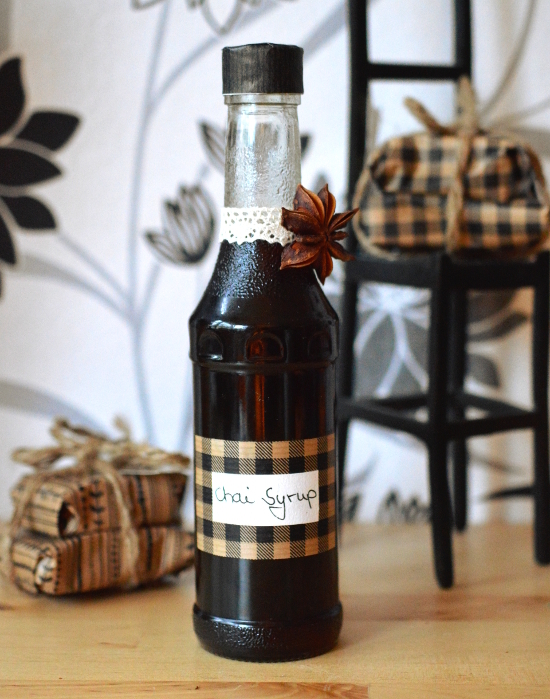 Farin sugar is a brown sugar to which sugar cane molasses or dark syrup has been added and it is really sticky. You can use any kind of sugar you like. I chose farin sugar because it has a dark malty taste to it. Bring the water with the sugar to boil on medium heat. When everything is dissolved, add the spices and let it boil slightly for around 20 minutes. 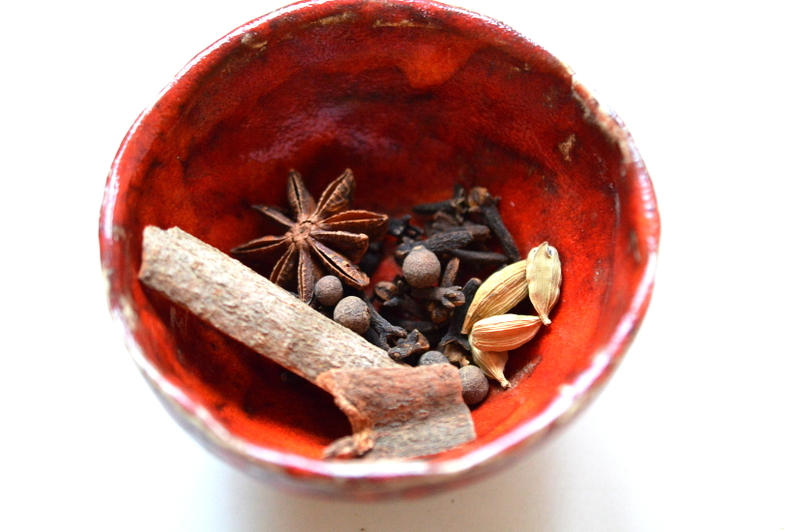 Pour everything through a strainer, or in case you used ground spices, through a cheesecloth and fill into bottles. The syrup should last in the fridge for a long time. Enjoy! 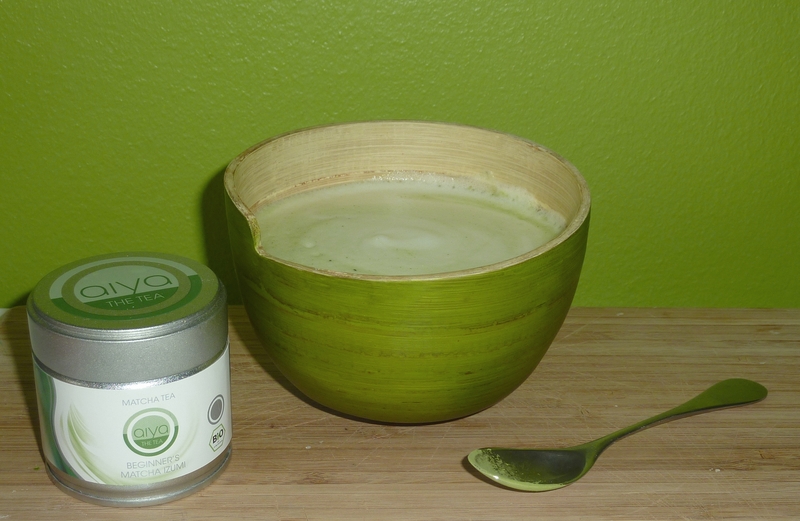 As it’s cold outside and I’m sitting on the couch drinking a bowl of matcha I just have to write a few words about it. It’s my new-found love. I read about it a while ago on the internet and got really interested. Matcha is green tea which has been ground to a fine powder. It contains a high amount of antioxidants which don’t get lost in the process since you eat the whole leaf instead of discarding them with a tea bag. Matcha is used in the traditional Japanese tea ceremony and was originally used as medicine, so make sure you’ll buy a high quality, organic one. I chose Aiya matcha since I heard good things about it. I have to admit that it’s bit pricey so I resisted buying the traditional bamboo whisk (chasen), bowl (chawan) and spoon (chashaku). After all I didn’t even know if I would like it. On the first try I made a matcha latte and it didn’t quite convince me. I used normal cow milk with it and I think that was the mistake. It just doesn’t quite fit. So I replaced the milk for soy milk and it’s really delicious. Whisk the matcha in a bowl (I just used my normal whisk since I didn’t buy the bamboo one) with some hot water until it’s all dissolved and foamy. Then add some hot foamed soy milk. 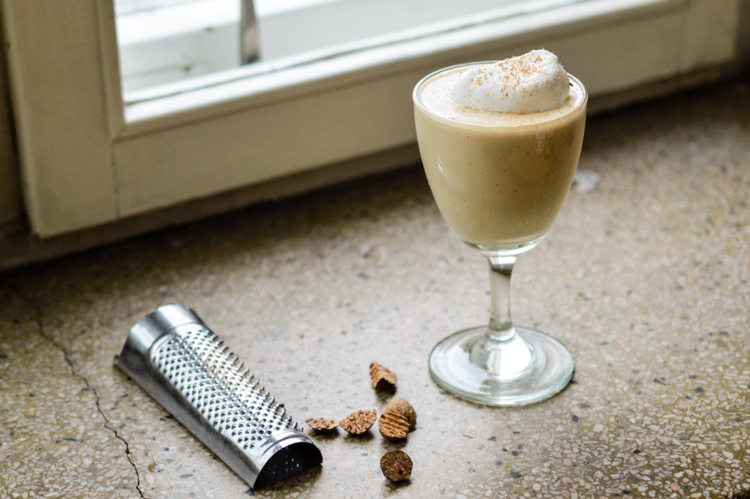 If you like you can sweeten the latte with honey or sirup. I used sweetened soy milk so that wasn’t necessary. Enjoy! You can also use the matcha for smoothies, baking and cooking. I think I will try to make some matcha macarons soon.